1. The Inverter motor or Serve motor is adopted in this machine for operation. 2. Main body construction by CNC , strong touge , less vibration , accuratc , endured usage and easy for maintenance. 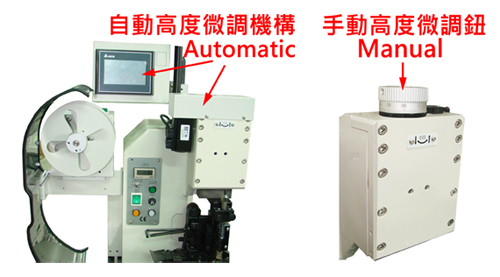 Option servo motor and new design adapted for manual height adjustment or automatic height adjustment mechanism. 3. This machine does not have parts like clutch,solenoid or any other traditional parts that makes loud noise. Thus, it provides a noiseless working environment for the operator. 4. By changing the base plate and the applicator fix head, side or end-type applicators from different brand can be used. This machine can be used in a wide range and It can be set on to the Full Automatic Machine for more usage.